A Southwest Michigan premiére - War Paint just closed on Broadway in November 2017. The Civic is thrilled to be one of the first theatres in the country to produce this new and exciting musical! In 1935 Manhattan, society women fret over beauty ideals imposed on them by an unforgiving culture. And center to it all are the empires of Elizabeth Arden and Helena Rubenstein. 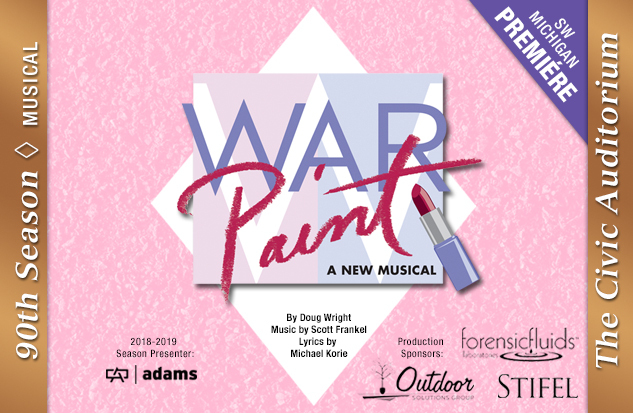 War Paint exposes the rivalry between the two most important women of the cosmetics industry from the 1930s to the 1960s...a story dramatic enough even without the music and the costumes. They could have been friends. Both brought up in humble surroundings, in these two powerful, wealthy women similarity bred contempt. Arden stole Rubenstein's marketing director, and then Rubinstein retaliated by stealing Arden's husband. Theirs was one of the great feuds in American business, like Macy's and Gimbals but with lipstick and eyeliner! "...the evening gleams like a freshly applied coat of nail polish..."
* Carrie McNulty appears through the courtesy of Actors' Equity Association, the Union of Professional Actors and Stage Managers in the United States. Water based haze and strobe lights may be used in this production.